to find hope and courage in the face of loss and evil. Despite the outbreak of many lethal viruses, diseases, and other health concerns plaguing our world, westerners often remain removed from the horrors occurring in other parts of the globe. These realities that may seem far away to some are front and center to author J. A. Myhre, who has worked as a doctor in East Africa with Serge for the past two decades. Fueled by a growing desire to share her experiences in Africa to foster compassion and empathy as well as address an underrepresented area in children’s literature, Myhre began The Rwendigo Tales, an African adventure series for children and teens. The series began with A Chameleon, a Boy, and a Quest (2015) and was followed by A Bird, a Girl, and a Rescue (2016) and A Forest, a Flood, and an Unlikely Star (2017). 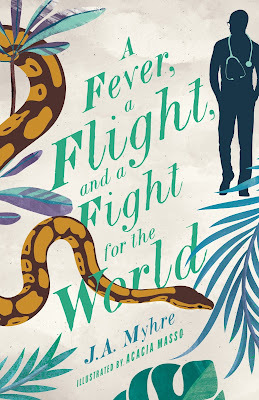 With the release of A Fever, a Flight, and a Fight for the World (New Growth Press/October 1, 2018), the fourth and book in the series, she aims to remind young readers that fighting for justice and triumphing over evil—even in the midst of great loss and hardship—is an adventure worth having. The first book was written for ages 7-12, but as the readers have grown, the reading level has matured as well. Written for 11-14+ youth who love reading and learning about faraway and different parts of the world, A Fever, a Flight, and a Fight for the World helps readers relate to characters and issues that seem much closer to home. Myhre explores significant social and spiritual issues throughout The Rwendigo Tales, and because of her own life experiences in East Africa, the fictional book is full of rich world building and compelling storytelling for readers of all ages. In this latest installment, a doctor volunteering in a village plagued by a mysterious, Ebola-like virus wakes up on a deserted island injured, sick, and near death—with no memory of how he got there. As Dr. Mujuni slowly regains his memory, he pieces together the horrific reality of what happened to the community he had been serving. A young girl named Kygala nurses him back to health, and he soon learns just how far the government-backed officials will go to silence all knowledge of the epidemic. They embark on a journey to go back to the mainland, but what they discover on the way is even more dangerous than they could ever imagine. In an effort to return young Kygala safely back to her village, the two encounter a series of dangers and hazards. Suddenly, keeping himself and Kygala alive isn’t Dr. Mujuni’s only concern. They must stop evil, power-hungry scientists and doctors from developing a serum that will transmit the virus to the population in epic proportions. This page-turning story of finding hope in the midst of loss will inspire readers of all ages to fight for justice, battle real-life issues in which we must overcome evil, and foster empathy and an interest in global human concerns. Throughout this fictional tale, children and teens are faced with the heart of God, who cares for his people and has overcome evil to rescue them. J. A. Myhre serves as a doctor with Serge in East Africa, where she has worked for more than two decades. She is passionate about health care for the poor, training local doctors and nurses, promoting childhood nutrition and development, and being the hands of Jesus in the hardest places. She is married to her best friend and colleague, Scott, and together they have raised four children for whom many of her stories were written as Christmas presents. New Growth Press publishes gospel-centered Christian books, small group, and kids’ Bible resources for discipleship, biblical counseling, and missional ministry. For more information about A Fever, a Flight, and a Fight for the World, visit www.newgrowthpress.com.